Monday: Reception, Welcome Drink, Reception Show. 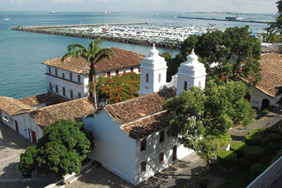 e Conference Dinner will be held in a historical restaurant, located in the Bahia Modern Art Museum, in the complex of “Solar do Unhão“. It operates in a rustic and charming environment and is a must visit in Salvador, for tourists and locals, due to its cultural traditional and its gastronomy. Upon arrival, participants will be greeted with a welcome drink and a short guided tour of the architectural complex of Solar and MAM-BA (a huge success in SBBD 2016). For the a la carte dinner, we will be ready with a delicious menu, including vegetarian options. During the dinner, we will have a great live musical attraction to make the evening even more welcoming. Friday and Weekend (pre and post conference): Excursions (a tourism agency will be available at the hotel and a booking form will be also available at registration time).